Thank you for purchasing VICTONY products! Our motivation comes from your satisfaction. 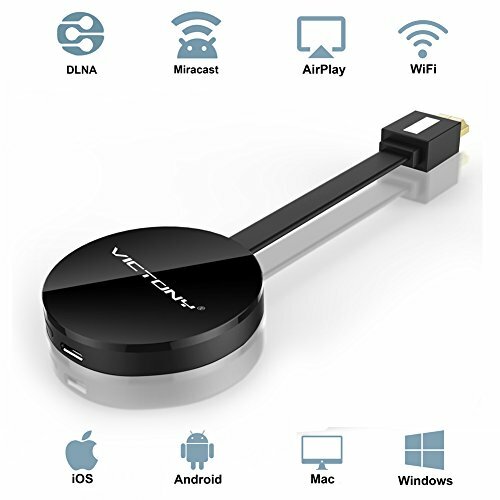 The VICTONY miracast dongle wireless display stick and multimedia display receiver (Airplay, WLAN, DLNA) can transfer your pictures, audio files and videos from your iPhone, Android Smartphone / Tablet to a HD TV, monitor or beamer via a WLAN connection. With this product, you can easily share high-resolution media files with friends and family. The stick is perfect for office and school presentations (Powerpoint, Excel, Word, PDF and images from the smartphone, tablet to HD TV or beamer). ★Please make sure your smartphone or tablet Miracast / DLNA is compatible before you buy the stick. 5. Open the "DxDiag.txt", press the ctrl+F to find the words "Miracast"
6. After you find the words, you will know whether your laptop support Miracast function or not. If not support, your laptop can not work with the wecast, whatever the mode. ★Please read the operating instructions carefully. For a certain group of people, the use of the system can be cumbersome at first. Please be patient with us. If there is any question about the use of the product, please contact us at any time. ➤Cordless Display: Stream 1080p videos, games, audio, pictures, apps and files from your mobile to your big HD TV, beamer and monitor. Support HDMI 1.4; A 1080P full HD output provides the perfect experience. ➤Easy to use: Widely application Airplay (for iOS/Mac) and Miracast (for Android/Windows) able to Synchronously cast photos / videos / office files / web browser / live camera / APPs from Smart phone and laptop to large screen of TV & Projector; DLNA supports you enjoy watching video on big screen while operating cellphone to do other things. ➤Compact & Easy to carry: The wireless stick is perfect for presentation in the office or at school (Powerpoint, Excel, Word, PDF and pictures from the smartphone, tablet to the HD TV or beamer, Projector). ➤After-sale service: The product is backed by a 1-year limited warranty and emergency replacement assistance. Please read and follow instruction patiently and correctly. Any problem met on you pls contact us at anytime and our service always be there (contact us for more information). Wireless Wifi Display Dongle,1080P TV Dongle Receiver Support Google Chrome for IOS/Android YouTube,Live Camera Sharing,etc.